ARRA News Service: Former GITMO Detainee Leads Taliban Fight Against U.S.
Former GITMO Detainee Leads Taliban Fight Against U.S.
Rasoul’s “stated mission is to counter the U.S. troop surge” in Afghanistan, according to the AP. Rasoul’s return to terrorism is a prime example of why Obama should not close the prison at Guantanamo Bay. What is he thinking when he knows that these terrorists are returning to the battlefield to kill Americans? At the same time that Rasoul’s Taliban promotion hit the news, five other Gitmo prisoners said they are proud of their part in the slaughter of innocents on 9/11. Obama stopped the trial for these terrorists, but a judge released their statements. "Killing you and fighting you, destroying you and terrorizing you ... are all considered to be great legitimate duties in our religion," said the five terrorists, one of whom is Khalid Sheik Mohammed the alleged 9/11 mastermind, who call themselves the "The 9/11 Shura Council,” which is the Arabic word for advisory group. Even the AP admits that the revelation of Rasoul’s leadership position and intent to attack American troops hurts Obama’s plans to close Gitmo and send the prisoners to the United States or other countries. America released Rasoul to the Afghan government, which released him. At least two Saudi detainees once held in Gitmo were released to Saudi Arabia for rehabilitation. Now they are al-Qaida members, National Intelligence Director Dennis Blair said. Move America Forward has produced a TV commercial focused on Obama’s dangerous plans to close Gitmo and says: we DO NOT WANT Terrorists brought from Gitmo to our homeland! Then GO Sign the Petition to Leep GITMO Open! 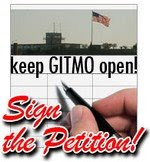 Tags: Blogburst, video, Gitmo, Move America Forward, Taliban, terrorist To share or post to your site, click on "Post Link". Please mention / link to the ARRA News Service. Thanks!